Close reading is definitely a "survival skill" particularly in a world drowned in information. 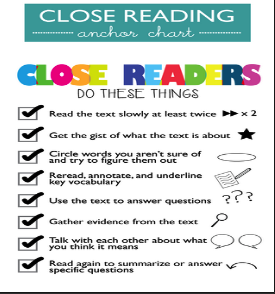 Close reading is all about reading differently, it is reading for deep understanding through paying attention to what others would normally oversee. Being a close reader entails focus and dedication to your reading material. It empowers readers to delve deeper into the latent meanings of text searching for cues that make the reading a totally different experience, one that resembles the detective work. Close reading is also about critical reading, reading that does not take things at face value but rather investigates for what is hidden between the lines. Below are two excellent posters I want to bring to your attention. You can print out and use these visuals in your class to help your students develop close reading strategies. 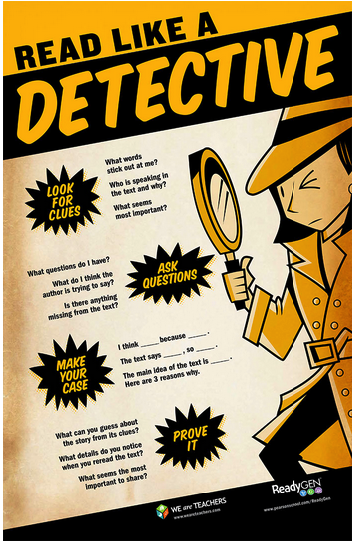 For more resources on close reading, I would suggest this Pinterest board.